It is curious how what appears so aesthetically pleasing obeys mathematical principles. 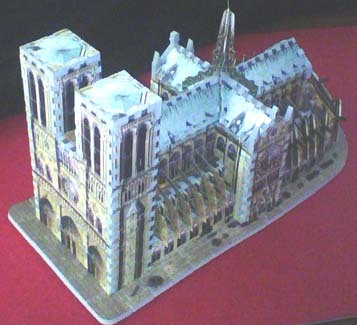 The Notre Dame cathedral in Paris has a beautiful gothic architectural design which follows the Golden Ratio. I believe that mathematics is a collective endeavor. Reasoning and sense making is what drives the field of mathematics forward. It is what makes math into a living, breathing, and intriguing science. Since I would love to be able to convey this facet of my subject to students, it is necessary for me as a teacher to look beyond the techniques for developing basic skills and utilize in my instruction techniques proven in classrooms to develop and nurture critical thinking and reasoning in students. I consider collaborative learning, teaching meta-cognitive strategies, modeling, and question posing to be the most useful techniques in developing reasoning in my mathematics classroom. Coupled with choosing worthwhile problems, heavy reinforcement of connections, communication, multiple representations and the use of technology, those techniques will foster students’ deeper understanding and reasoning. These strategies are aligned with the recommendations in the PSSM – in terms of both its standards and principles. As an instructor I want to build both my students’ confidence and skills. I want my students to become fluent and flexible in their mathematical reasoning. It is my job to make students feel safe to venture ideas in my classroom. I need to instill in them confidence in their abilities, as well as repeatedly give them opportunities to prove they can be successful. I need to be constructive but at the same time I need to stay flexible and give students chances to demonstrate their creativity and become more self-directed. I think that it is essential to communicate clearly to students my classroom rules and routines and adhere to them on a daily basis. I need to stay organized and communicate my expectations well. I need to always acknowledge individual student contributions to class discussions and empower students. I want students to stay willing to contribute again and again in my classroom, and I also want them to feel valued assets in my class and help build their positive self images.